In drylands, microbes that colonize rock surfaces have been linked to erosion because water scarcity excludes traditional weathering mechanisms. 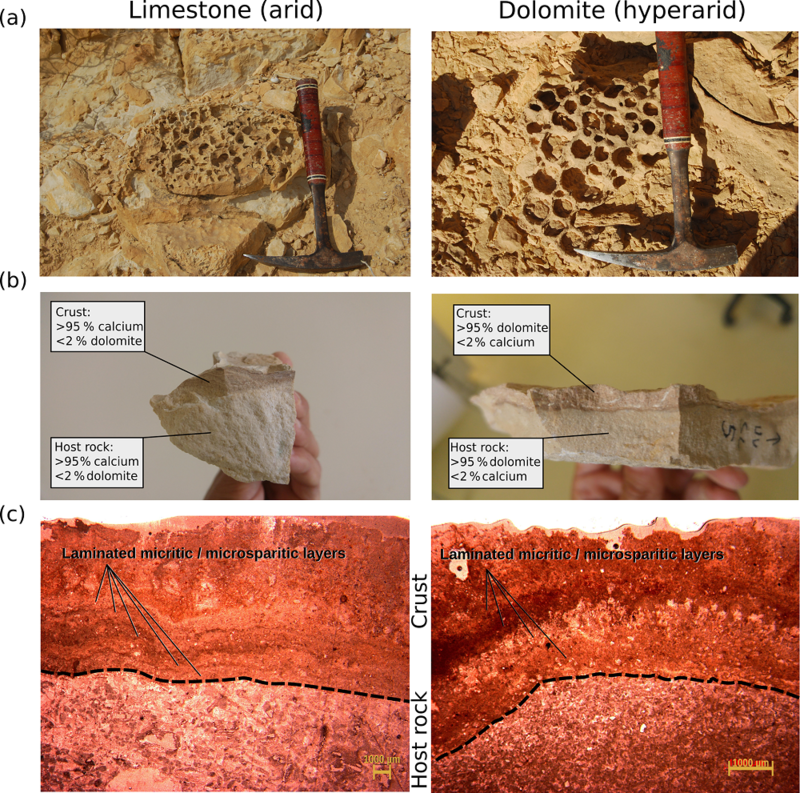 We studied the origin and role of rock biofilms in geomorphic processes of hard lime and dolomitic rocks that feature comparable weathering morphologies, although these two rock types originate from arid and hyperarid environments, respectively. We hypothesized that weathering patterns are fashioned by salt erosion and mediated by the rock biofilms that originate from the adjacent soil and dust. We used a combination of microbial and geological techniques to characterize rock morphologies and the origin and diversity of their biofilms. Amplicon sequencing of the SSU rRNA gene suggested that bacterial diversity is low and dominated by Proteobacteria and Actinobacteria. These phyla only formed laminar biofilms on rock surfaces that were exposed to the atmosphere and burrowed up to 6 mm beneath the surface, protected by sedimentary deposits. Unexpectedly, the microbial composition of the biofilms differed between the two rock types and was also distinct from the communities identified in the adjacent soil and settled dust, showing a habitat-specific filtering effect. Moreover, the rock bacterial communities were shown to secrete extracellular polymeric substances (EPSs) that form an evaporation barrier, reducing water loss rates by 65 %–75 %. The reduced water transport rates through the rock also limit salt transport and its crystallization in surface pores, which is thought to be the main force for weathering. Concomitantly, the biofilm layer stabilizes the rock surface via coating and protects the weathered front. Our hypothesis contradicts common models, which typically consider biofilms to be agents that promote weathering. In contrast, we propose that the microbial colonization of mineral surfaces acts to mitigate geomorphic processes in hot, arid environments.